Beneath, what, you might ask? In this case it is metal, made dull and uncommunicative through time and poor handling. Collecting and appreciating Japanese swords (nihonto) is a hobby of mine, though more of an aspiration-hobby than one I consistently pursue. More than two years ago I posted on a sword I had bought on eBay, where I described getting the sword fitted with new koshirae – scabbard, hilts, etc. Now, I had this work done because I had liked this sword. It seemed “healthy” – with a lot of original metal, few nicks or other damage – and I liked the feel of it. The next step in bringing this sword back to what it was like when first made would be to have it “polished”. Now, “polishing” sounds like a jeweler’s term and in fact many unknowing people attempt to improve Japanese swords using buffing wheels and jeweler’s rouge. This is in fact one of the worst possible things that can be done to a sword. The proper thing is to take the sword to a togishi, a traditional sword polisher. The sense of what a togishi actually does I would say is closer to “sharpener” or “shaper” than polisher. Many people know that Japanese swords are constructed using folded steel, similar in some ways to Damascus steel, but refined and molded by the needs and conventions of Japanese warfare – for example Damascus swords do not have the differentially tempered edge of a nihonto. 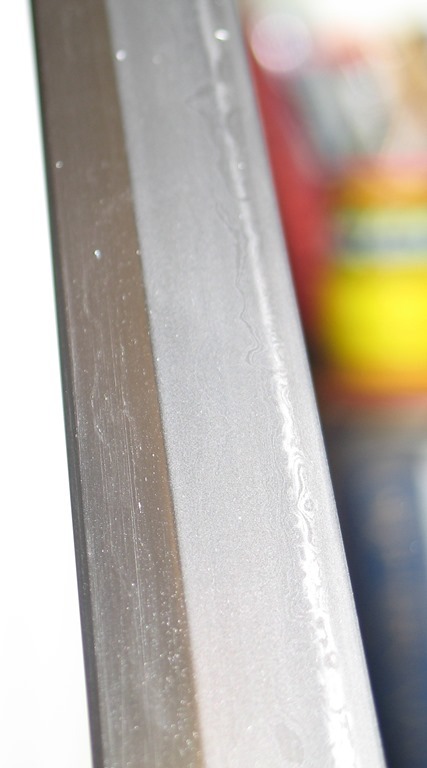 But in additional to the raw construction, a Japanese sword gets its famous cutting ability from its cross-section. The sides of the blade are convex, not concave like a hollow-ground Western knife. This makes the sword stronger in battle, it can receive the strike of another blade with much less chance of severe damage. And when cutting, the bowed sides force aside the material being cut; without this the sword would get, well, stuck in its target. To get this shape, and the proper edge, you need a togishi, who will work by hand using stones of varying fineness to remove metal, shape the blade, and create the edge. It has of course been 100s of years since these swords were used primarily for battle. But even in ancient times the utilitarian aspect of the togishi’s work was complemented by an aesthetic one. A side-effect of this work is that the grain of the metal – the hada – and the extent of the temper line – the hamon – become visible and throughout history warriors and connoisseurs both have had appreciation of a properly polished weapon. My sword was much in need of this treatment. Whoever had it before me clearly had used mechanical tools to buff the steel to matte finish. It looked like a sword, but any details of temper line or grain were almost entirely obscured. I oftentimes would stare it, trying to angle the light in different ways, searching for a temper line. 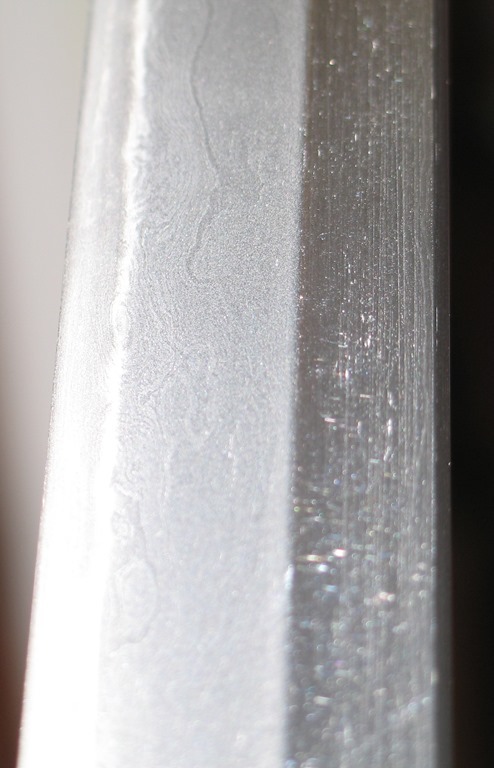 This sword has a signature on the tang and my amateur’s judgment was it was made in the late 19th century, but it could well have been a 20th century sword, many 1000s of which were made by hand in WW2, though using inferior steel and methods. Such swords are generally much less interesting than those from earlier eras. The only way to find out what was really there was to enlist a togishi and ask their help. Nowadays on the web it is easy to find lots of people advertising this service. Anyone thinking of having a sword worked on should be aware there are many weak practitioners out there, and also some out and out dishonest ones. The togishi I quickly settled upon was David Hofhine (http://www.swordpolisher.com/, https://www.facebook.com/swordpolish). His website had impressive examples of his work and when I inquired via email about my sword he gave very knowledgeable and thoughtful responses. Be prepared, if you have a sword to be worked on, the waiting time will be long, two years or more. Beware the togishi who says he can take your sword right away! In all likelihood it means they are not very good, or are using artificial methods to quickly treat swords. Enough of the background. I got on David’s list in 2012 and when I returned from India in 2014 my turn had come. When I sent the sword in July and David received it, he was skeptical, thinking there was in fact a chance the sword was a low-quality 20th century blade. He offered to do an “exploration” – meaning he would work on some small part of the blade to see what was there. This was an example of David’s professionalism, which I much appreciate – polishing a sword is not cheap and David wanted to give me a chance to see if that investment would be worth it. The exploration returned good news – this was a “real” folded blade with grain and temper line. I asked David to do a “foundation polish”, roughly comparable to what a working samurai would have done to his sword. 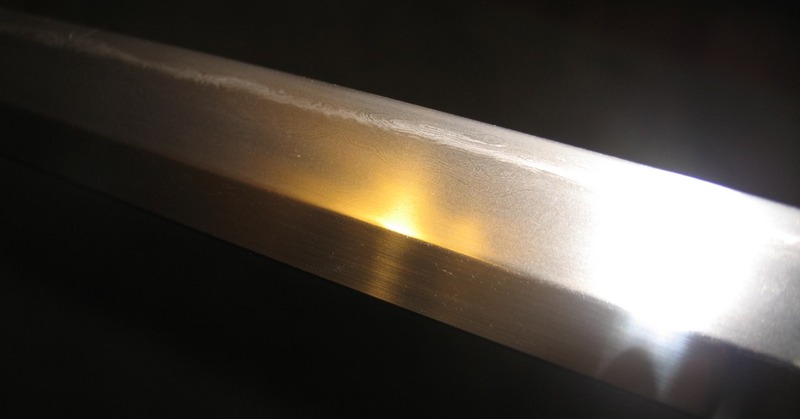 A further step, at additional cost, is a “finish polish”, but that is really only appropriate for more valuable swords, or swords where there’s expectation of special aesthetic features. The temper line I would say is suguha – straight – while the grain is harder to classify, at least for me; itame (wood grain) would be my guess. For now the terminology is beside the point. Just having this artifact, in the condition much like it was in when first made, is very satisfying for me.